Yes campaigners should stop believing their own spin, and engage with the realities of a Scotland which voted no. The independence referendum was a historic moment, an epic time in Scotland’s political evolution, and an awakening of the democratic impulse. Yet, it produced a comfortable victory for No and a defeat for Yes. For all the commentary that Yes won the campaign and that the idea of independence has been normalised, defeat has an upside: an opportunity and release which shouldn’t just be squandered. Defeat allows for catharsis and political renewal. This is an evolution that successful political parties the world over understand: think Labour in 1983 and 1992, or the Tories in 2005, and the disaster that befalls a party that ignores this, such as Scottish Labour in 2007 and 2011. 1. There is no 45. The 45% reference is a chimera, a passing moment on the day of September 18th which isn’t a permanent political force. It provides no pathway to a Yes majority, and instead is a political wall, which has in it an element of soft sectarianism. Many prominent Yes supporters still embrace ‘the 45’ on twitter and social media – something understandable in the immediate aftermath of September 18th but which isn’t really excusable nearly three months after the vote. 2. There is a propensity to belief that Yes speaks for Scotland, missing that No won. It is a common trait of bad politics to pose the world as you want to see it, rather than it is, and then build your perspective from this. Making the mistake that Yes speaks for Scotland misunderstands politics on numerous levels: the nature of democratic legitimacy, the contours of the No victory, and any notion of future political and constitutional change. Pro-independence opinion has to grasp that it does not speak for majority Scotland, reach out, listen and empathise, and not engage in a politics which has an element of smugness and self-righteousness. 3. The pro-union majority did not vote out of selfishness, false consciousness or other reasons which can be dismissed. Instead, like independence voters they were motivated by a huge variety of reasons – all of which are valid. 4. The union case did not win just because of middle class Scotland. They provided major support in places, but there are many different middle class sectors and cultures. For example, public sector professional middle class provided significant support to Yes. And sizeable sections of working class Scotland did not vote Yes which brings us to the next point. 5. The notion that Yes won working class Scotland is far too simple to be true and as problematic as placing middle class opinion completely in the No camp. The independence case won parts of the working class, but not comprehensively or uniformly. Yes won majority support in the C2 skilled working class, but lost the DE semi and unskilled working class. This shows that the working class overall was fairly evenly divided between Yes and No – a picture which was one of the anchors of a No victory. Thus the reality is not of working class success for Yes, but of a fractured, divided working class. Indeed, the situation in class is much more complex than these blanket and universalist terms imply. At the recent Radical Independence Conference (RIC) in Glasgow, many people talked of the need to represent and have a party of ‘the working class’, but often in a scattergun manner without much meaning. For the last forty years left-wingers have been debating the moving terrain of class politics across the West, and nearly always been behind the curve of capitalist dynamics. A new kind of language and terminology on class, status and exploitation is required – one which people such as Guy Standing has pointed towards with his notion of the precariat. It has to be not defensive, but focused on new forms of collective action and identity, autonomy and understanding that individualism isn’t the same thing as neo-liberalism. 6. Related to the above is the oft-repeated point that Yes won the Labour heartlands. This is wrong on both counts – first in terms of areas that voted Yes and in what counts as a ‘Labour heartland’. Only four out of Scotland’s 32 local authorities voted Yes; of which three – Glasgow, North Lanarkshire and West Dunbartonshire – can be described as Labour heartlands. Dundee which also voted Yes (and did so by the biggest margin in the country) has frequently and inaccurately described a Labour heartland. This is a bit of a time warp, as the last time this was really true was 1973-74, considering the SNP’s Gordon Wilson won Dundee East in February 1974, and the SNP has held the seat in the Scottish Parliament from 2003. And significantly, several traditional Labour areas such as Fife, Renfrewshire and South Lanarkshire voted No. A more subtle analysis of ‘Labour heartlands’ would concede that this was a political constituency markedly divided and fragmented. 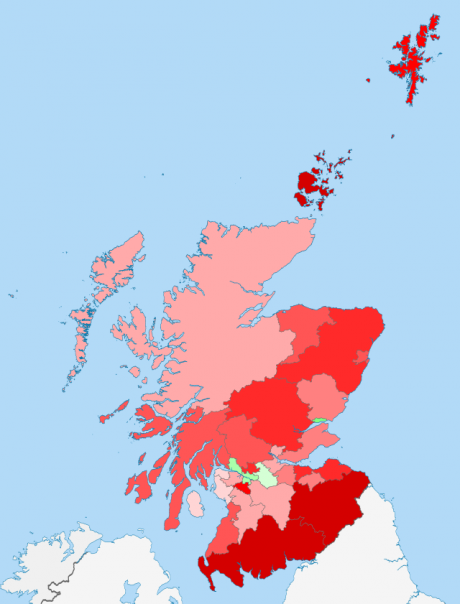 The political argument that 37% of Labour voters turned out for Yes and presenting this as a great success has a similar mistake; for one the 37% is of 2010 Westminster voters and contains a huge section of Labour Nats – people who vote Labour at Westminster and SNP at Holyrood, while it also disguises that Yes Scotland consistently failed to develop a serious strategy towards Labour voters. 7. Another powerful myth has been that the Yes vote was more mobilised than No. This is often connected to the myth of a working class Scotland in previously solid Labour areas turning out in record numbers. This articulates a story of working class council estates throwing off their apathy and disconnection to politics, and turning out for the first time to vote in generations. There were uplifting activities and moments – from RIC’s Mass Canvas to the scenes in some estates such as Craigmillar and Niddrie in Edinburgh where people organised processions and marches to the polling station. However, all of this, while of value, was often symbolic, and was more than offset by middle class and No mobilisation. The highest turnouts were in the most affluent and pronounced No areas: East Dunbartonshire 91%, East Renfrewshire 90.4% and Stirling 90.1%. 8. The mobilisation of No was about much more than Project Fear, the Vow and Gordon Brown’s late interventions. The independence cause and referendum brought up for a whole swathe of Scotland feelings of being threatened, anxious and under fire in terms of finances, security, status and positional place. Independence meant for many voters that they would lose something valuable and precious, almost existential, and this made them deeply uncomfortable. These feelings should not be caricatured or dismissed as wrong, but understood as they put up a set of impenetrable barriers which prevented the independence argument reaching out to large parts of Scotland. In this the 2014 referendum was very different from that of the 1979 and 1997 votes. 9. There are many different political communities in Scotland with numerous faultlines and divides. A critical dimension is that of insider versus outsider Scotland – which taken at the levels of geographical location or social place – turned out for No. The further removed people were from the Central Belt the more likely they were to vote No. Thus, Shetland (64%), Orkney (67%), Dumfries and Galloway (66%) and Scottish Borders (67%) were all emphatic No areas. The reasons for some of this are illuminating: dislike of Edinburgh authority and centralisation, a feeling that the SNP did not understand the needs of ‘far-flung’ parts of Scotland, worries about losing EU funding, and even that London rule was for some less insensitive than the prospect of an omnipotent Edinburgh. The gathering of power to Scotland’s capital erected powerful barriers to the appeal of further self-government and questioned the relationship between independence and greater democratisation. To take one example, in Dumfries and Galloway, many people complain frequently about the lack of priority treatment of police calls now there is only one national police force compared to previously. The removal of the local and experience of centralisation has in places hurt the independence cause. 10. Large parts of Yes did not really understand No. Some did not want to understand it, taking pleasure in articulating a set of stereotypes, while others went further and cast doubt on the reasons and motivations of a large part of the No coalition. No ran an extremely poor campaign – in terms of messaging, politics, positioning and grass roots organisation. And yet they still won by a sizeable margin. One reason is that, while it is correct to celebrate the positive hopes and mobilisation of many Yes supporters, there is a need to reflect on the panoply of emotions and motivations of the No majority. Their version and vision of Scotland – which contained like Yes many different and contradictory ideas and futures – is as valid and counts as much as any on the independence side. 11. Yes and No are over. They are not the future. There is no future in them. They belong to the past – and died on September 18th. The Yes/No binary has to be lost to allow the emergent new voices, spaces and movements which came forth in the referendum to grow, be set free, and find a place to flourish which is not dependent or related to the independence referendum. 12. There can be no real Yes Alliance. This is for a number of reasons. Yes cannot live as a political movement post-September 18th. There is the nature of First Past the Post at Westminster. The strength of the SNP in comparison to other pro-independence voices such as the Greens, Scottish Socialists and independent voices. Any Yes Alliance would just be an SNP led popular front, and whether by intention or not would lead to the incorporation of some of the radical currents which came to the fore in the campaign. Finally, what of the future? First, Scotland has to be understood as more than a series of competing tribes: Yes and No, pro-independence and anti-independence, nationalist and unionist, SNP and Labour. The undercurrent of this is an attempt by partisans on each of these sides and camps to reduce every opinion down to two perspectives and a politics of two tribes. Everything revolves around the question: whose side are you on?, and who do you most trust to look after Scotland? Other questions about democracy, the environment, sustainable economic growth, and how we run public services are lost in this divide, as is any real space for radical progressive politics. Second, one of the most positive aspects of the indyref was the self-education of hundreds of thousands of Scots who showed initiative, curiosity and a willingness to learn and act for themselves, rather than being spoon-fed the predictable narrow diet of official Scotland. It is this rich practice – of opening up debate and choices and refusing to accept the stale offerings of politics, media and power which have historically characterised so much of our public life –which has to be encouraged and given sustenance. This then requires that independence and self-government supporters don’t believe the hype and rhetoric of their own side. It is no good replacing one set of limiting orthodoxies with another and think that repeating mantras which lack any substance is enough. This is a time of huge uncertainty and fluidity in Scottish politics, the UK and globally, and any radical politics has to reflect and understand this in its attitude and animating spirit. Post-indyref there has been the ‘Sturgeon surge’, the repositioning of the SNP more on the centre-left, while politics has focused on Scottish and UK constitutional change and the potential timescale and conditions of a second indyref. Yet nothing is ever as simple as it first seems. For example, Scottish Labour is currently leaderless, disorientated and without direction, and despite Ed Miliband’s best efforts the party north of the border will not be as weak as it is now as it approaches the 2015 UK election. Then there are the dynamics of the British government and state, which for all their crises and problems, hasn’t lost all sense of legitimacy in Scotland. There can be no final destination or ‘settled will’ for any truly radical politics, and particularly, a radical independence politics. That means challenging conventional wisdom on the independence side, not listening to the most siren and certain voices, and instead nurturing a set of spaces and resources – comfortable with pluralism, dynamism and even doubt. That after all is what a rich ecology and culture of self-government would look and feel like. And the exciting thing is that it is within our grasp.